Protect your vehicle’s paint with clear bra protection. Clear bra paint protection is a clear, virtually invisible urethane plastic film that protects the leading edge of your vehicle from damage caused by stone chips, abrasion, salt, insects, and most types of environmental damage. 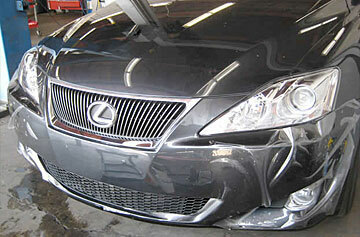 It does not harm paint or alter your vehicle’s appearance or aerodynamics in any way. Once clear bra paint protection is applied, you can continue to wash and wax your vehicle as you always have. This state-of-the-art paint protection film is resistant to yellowing and staining, so the beauty and integrity of your exterior finish is preserved.